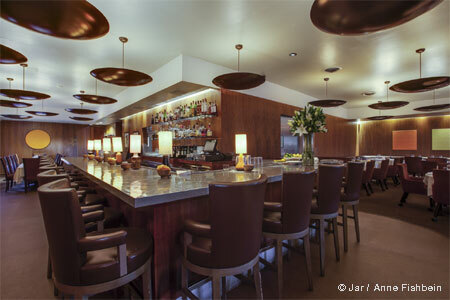 Stylish gastropub in Echo Park serving traditional and ambitious British fare alongside many draught beers. : Who would have thought that a British gastropub taking over Barragan’s would arguably become one of Echo Park’s top dining destinations? It’s owned by Brits who transformed the old neighborhood dive into something of a Downton Abbey-kitchen-meets-hip-London-pub. Visit for darts and big-screen sports among communal tables topped by vintage typewriters, a sprawling upstairs bar/lounge with DJs and a leafy patio. The selection of local, English-style craft beers rotates, and classic British cocktails are solid. You could easily sup at the bar on Welsh rarebit, devils on horseback (prunes filled with Stilton and pear compote wrapped in bacon) or house-made sausage rolls. But if there’s one dish to travel here for it’s the Stargazy Pie, a traditional Cornish fish pastry. Made with boneless Idaho river trout, roast parsnip purée and flaky puff pastry, it’s eye-catching with the trout head and tail insouciantly breaking out of the crust (“gazing” at the stars). 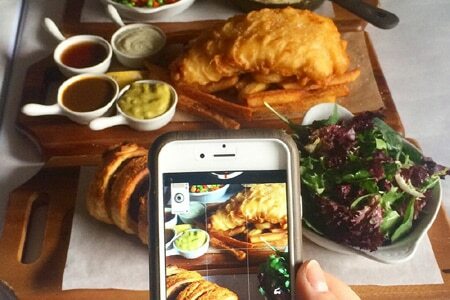 Fish ‘n’ chips is among the best in town, made with a gigantic hunk of moist, fresh cod fried in an air-light batter. Savory lamb-based shepherd’s pie is also a serious contender. Strawberry shortcake with Chantilly cream makes a good finish.